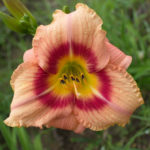 Of all the parts of a daylily, the eye makes a statement, whether it be subtle or striking. 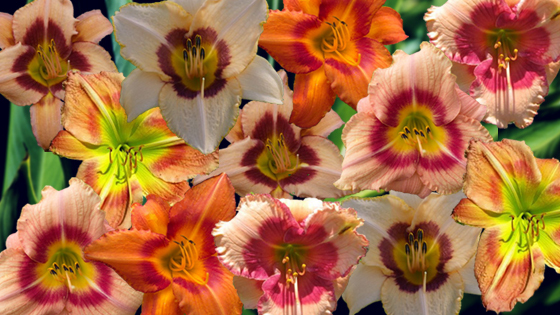 With such a large variety of cultivars here at Smokey’s Gardens, we thought we would share a few with you that represent some of the most gorgeous ‘eyed’ daylilies. 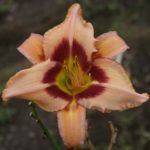 If you are interested in searching through our site for a daylily by its characteristics, including those categorized by ‘eyed,’ click your choices in the search section under the All Daylilies tab. This award-winning rebloomer is pink with a prominent red eyezone that will stand out in your garden. It has lightly ruffled edges and is an extended bloomer. Annie T. Giles Award 1974. Flower diameter is 3”. 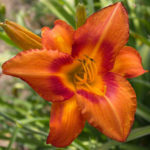 Looking to go bold with your daylilies? If so, here is another award winner for you. It is a salmon rose with a large maroon eye and yellow throat. It is recurved and has a flower diameter of 5”. Honorable Mention 1988. The contrast between the light pink of the petals, wine-colored eyezone, and an ivory-green throat makes Gay Cravat an exceptional choice for a yard needing a punch of color. It is ruffled and recurved with a flower diameter of 6”. Honorable Mention 1980. 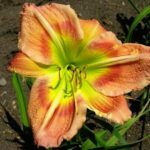 Our fourth award-winning daylily, Jamaican Music, is a magnificent stunner with its pink petals and bright red eye above a green throat. It is a fragrant rebloomer. Honorable Mention 2005. Flower diameter is 5”. 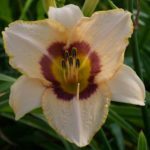 This special daylily is an award winner in both landscape and exhibition categories, making it one of the rare daylilies to do so. It is clear orange in color with a red eye and is fragrant, ruffled and a rebloomer. Honorable Mention 1981, Lenington All American Award 2002. Flower diameter is 6”. Last, but not least, is a four-time award-winning beauty. New Series is a clear pink with rose red eyezone and a bright lime-green throat. 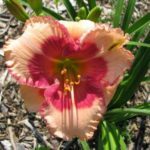 It is a rebloomer with extended blooms and is lightly ruffled. Junior Citation 1983, Honorable Mention 1986, Award of Merit 1991, Don C. Stevens Award 1991. Flower diameter is 7.5”. There is no question, something about the eyes gets our attention. And, with each of these special cultivars taking home awards, the eyes have spoken.